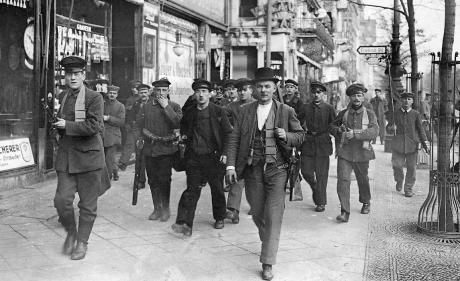 Reflections on the 1918 German revolution at the CWO/ICT Public Meeting in London (November 17 2018). Hegel wrote that “people learn history but do not learn from history”. Today we are facing a capitalist system which is not only placing the planet in danger of being unable to sustain life it is also in an acute and long term crisis only partially staved off by the accumulation of a vast pile of debt which threatens yet another disaster in the not-so-distant future. The failure to find any real economic solution is slowly forcing the ruling classes everywhere to take more extreme nationalist stances, tearing up treaties, shutting down trade and creating new bases from which to project their power. They don’t want war but they don’t want to give ground to their rivals either. To escape its long stagnation capitalism needs to devalue to allow a new round of profitable accumulation to begin. Ideally what each power wants to do is degrade the value of the rival powers’ capital (whilst leaving their own largely untouched) but this just opens up the path to a more generalised conflict. And though that war is as yet some way offleftcom.org”  the capitalist mode of production’s continued crisis means that the options are narrowing. If there was more evidence required to demonstrate how decadent the system is we don’t know what it is. There is definitely a sense that things cannot go on as they are. We are already seeing the growth of a poisonous nationalism which is slowly enveloping even elements of a working class which has seen its standards of living and way of life disintegrating over 40 years. At the moment it plays on the fact that the working class is more and more exploited. Our class responses to austerity so far have been few and inadequate. Although today there is no SPD with its fake socialism so entrenched inside the working class but there still are plenty of wannabe SPDs out there whose reformism has to be fought. However all the features we have underlined so far are the things over which we have no control. 2.The party (the Internationalist Communist Party) was thus not founded until 1943 in response to a new wave of struggle in Northern Italy which had echoes in other places. 4.The current cult of Corbynism is a case in point. Its policies like putting workers on company boards alongside shareholders sound radical but are in fact similar to the Stinnes-Legien Agreement of 1919 where the SPD unions agreed to calm workers’ struggles in return for the setting up of works councils. It has been the basis for German capitalism’s “social peace” ever since.